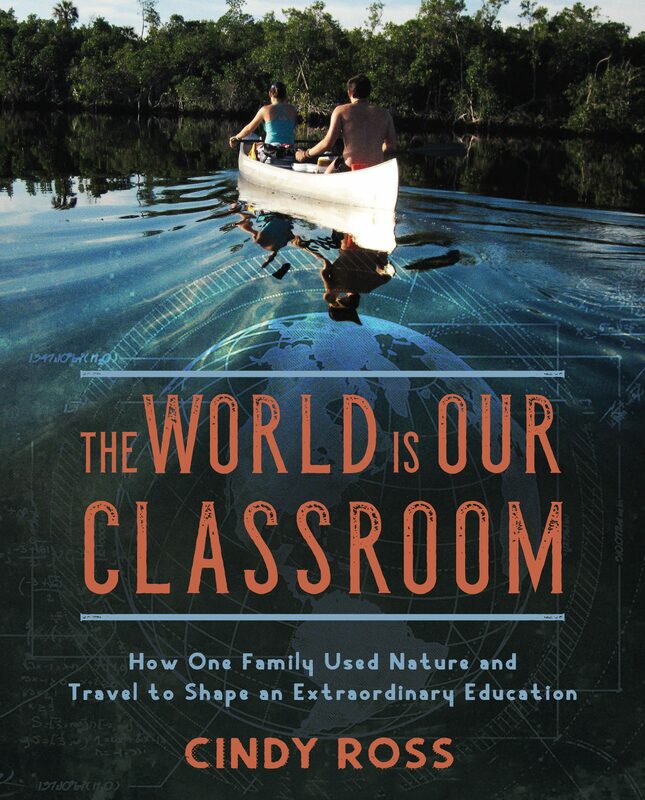 It all began with one mill and one monstrous natural spring. William Lamb had a vision when he saw this “power source” able to grind flour and produce food for a growing community. Lamb believed that this first permanent settlement in the Nittany Valley would have a long and bright future and he was right. Bellefonte was born on the banks of Spring Creek back in 1785. This singular gap in the ridge running along Bald Eagle Mountain, where Spring Creek powers through is where this beautiful Victorian town sprung up. 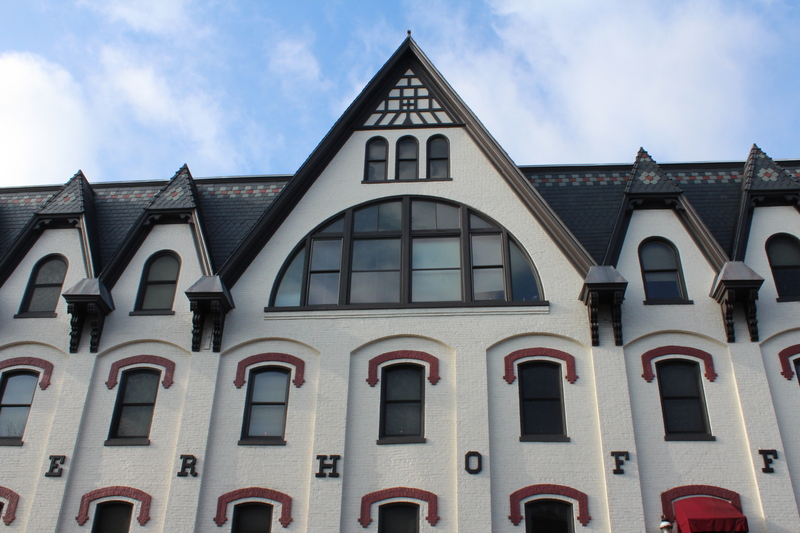 This charming town is decorated with dozens of exquisitely preserved period buildings, lavished with ornate ironwork, gingerbread details, and stunning architecture for at one time, Bellefonte was the most influential town between Harrisburg and Pittsburgh. “The Big Spring” – a 11, 500,000 gallon a day rushing wonder, is the source of the town’s water supply and is the town’s namesake, christened by Talleyrand, a French statesman who was in exile in America during the French Revolution. Legend claims that when viewed for the first time, he called it “Beautiful Fountain” or Bellefonte. Perhaps’ Bellefonte’s most beautiful season to visit is winter when the dozens of stone homes and stately political buildings put on their best dress for the Christmas holidays. For thirty-two years, the town has celebrated the season with its weekend Victorian Christmas celebration. My husband, Todd and I are a week early for the big event, but we have chosen this stunning town for our own personal celebration- our wedding anniversary! The iron industry first brought people to the village for its surrounding land provided high quality limestone, timber, iron ore and coal, as well as that amazing spring water and creek to power machinery. Keeping in the Victorian theme, Todd and I stay at the Reynold’s Mansion a proud, blue brownstone perched on a hillside. This Gothic-Italianate-Queen Anne style has a distinct purplish cast, quarried in Hummelstown, PA. This 1883 mansion of Major William F. Reynolds has been lovingly restored into a charming B&B. Owners Mike & Tricia Andriaccios point out the hand-carved shutters, chestnut parquet floors, ceramic tile fireplaces, exquisite woodworking are beautiful architectural details from this extraordinarily creative age. 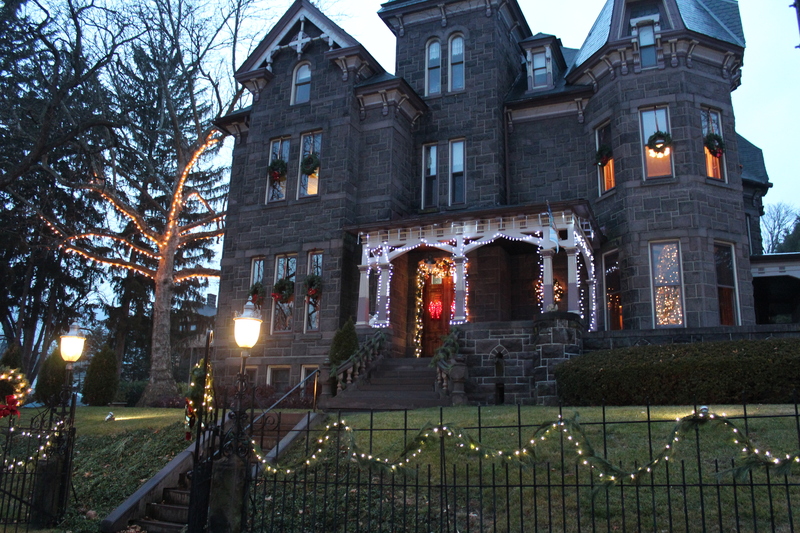 It was voted “Best B&B near a university,” as Penn State is merely ten miles away. 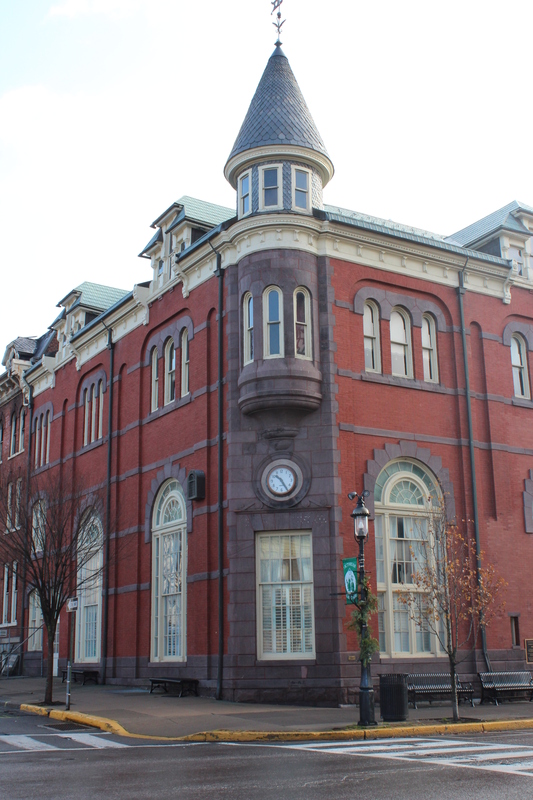 Reynolds was instrumental in bringing the Diamond Match Company to Bellefonte- a commanding brick, 18-building factory that has been restored and renovated to house America’s Philatelic Center- the historic and working center for one of America’s oldest hobbies- stamp collecting. You can also learn about Pennsylvania’s role in air mail history, for this important town, located half way between New York and Cleveland, was a stop on the first inter-continental air mail service. 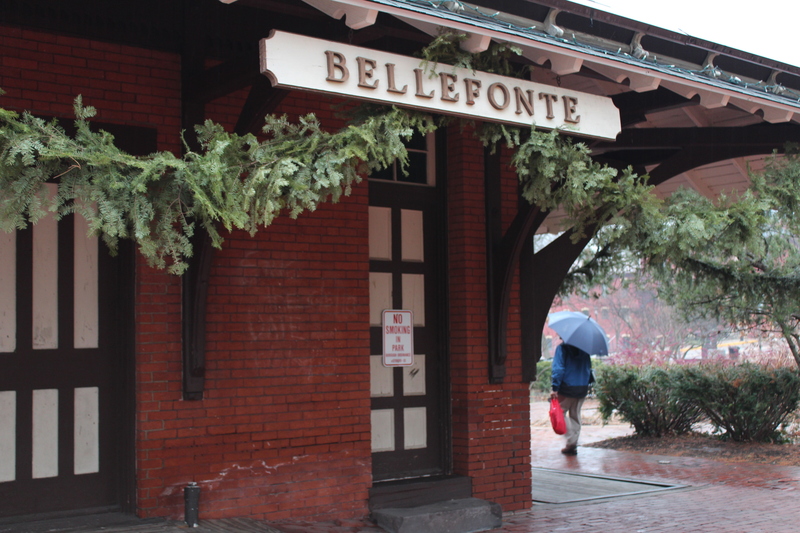 There are 46 locations on Bellefonte’s Historic Walking Tour, including the train station which houses Bellefonte Chamber of Commerce, a good first choice stop when taking the tour. Mansions, court house, cemeteries, hotels, parks, as well as the mill (Gambles) and Big Spring, where is all began is included. We stop in many of the specialty shops and boutiques all within walking distance of our B&B and become particularly fond of Plaza Centre-a 30,000 square foot building which was once the home of two historic theatres- the Ritz and the Plaza (circa 1929). Seventy antique dealers from throughout Central PA provide many opportunities to purchase unique gifts for the holidays. Or, stop in the handsome stone Bellefonte Art Museum of Centre County for a gorgeous piece of local artwork, for local artisans showcase their work during the month of December. It makes no difference if you are a stamp collector or not to be intrigued with the American Philatelic Center. The highlight of the restored Match Factory is a complete 100 year old general store/post office that has been dismantled and reconstructed in its entirety all within the factory’s walls. After serving the citizens of Sheetz Mills, VA, it enjoyed a second life in the Smithsonian Natural Museum of History and Technology, Washington DC before coming to its final resting spot in Bellefonte. The 18’ X 30’ structure is virtually unaltered both inside and out with its original shutters, doors, windows, counters along with the pot-bellied stove. Civil War soldiers who were stationed in the area inscribed their names on the shutters. If you come for the Victorian Christmas celebration weekend, you can enjoy horse drawn carriage rides, home tours, art & craft vendors, entertainment, concerts, teas, puppet shows, train displays, and a festival of trees. But even before or after the big event, Bellefonte is a stunningly beautiful town to spend some time, especially during the holiday season. Todd and I wind up our weekend getaway with dinner at the Gamble Mill Tavern, restaurant and microbrewery which was originally Lamb’s first settlement, which gave birth to this whole beautiful town. 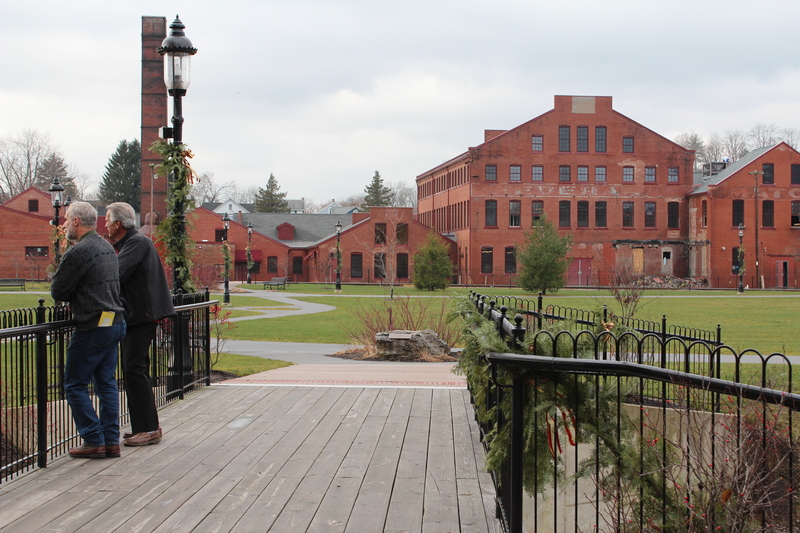 The impeccably restored brick mill, owned by Dave Fonash and Paul Kendeffy, serves delicious meals and hand crafted beers. Waitresses deliver your goodies over the creaky original floorboards, and all are well versed in the history and folklore of the place. Historic old photographs decorate the walls and water still flows through the raceway and under the building. But now, in present day Bellefonte this sweet water is also used to produce delicious craft beer, an honorable future for a town immersed in history and bright starts. William Lamb would approve.